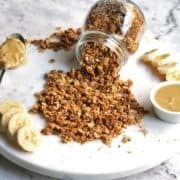 This irresistibly healthy Peanut Butter Granola is made with just 6 ingredients and is perfect for mixing up your breakfast routine. Sprinkle on top of yoghurt, smoothies or enjoy a big bowl with your favourite milk! Who doesn’t love a good granola? I prefer to make my own as I find many store bought brands load theirs up with an unnecessary amount of sugar. I usually whip up a batch of my healthy homemade granola every month or so to mix up my breakfast options. I’m tend to get in a bit of a rut and eat the same things day in and day out! But after finding FIVE jars of unused peanut butter in my cupboard last week (I’m a sucker for a sale), I decided to try and make a peanut butter version. One bite and I was hooked. In fact, I’ve made this recipe three times in the past week. This recipe couldn’t be simpler – just 6 ingredients and ready in under 30 minutes without much hands-on time. This recipe is also easily adapted, so if you want to throw some coconut or chocolate chips in, go right ahead! Preheat oven to 160C / 325F. Line a baking sheet with baking paper. Melt wet ingredients together in a saucepan over low heat. Place dry ingredients in a bowl, then pour over wet ingredients and mix thoroughly until well combined. Pour mixture onto baking sheet, spreading out into a thin layer. Place in oven for 20 minutes, stirring half way through. Keep a close eye to make sure it doesn't burn. You'll know it's done when it's golden brown all over and dry to touch. Allow to cool fully, then pop in an airtight container and store for up to two weeks (it won't last that long). Feel free to sub rice malt syrup for maple syrup, honey etc. Feel free to sub coconut oil for your oil of choice. 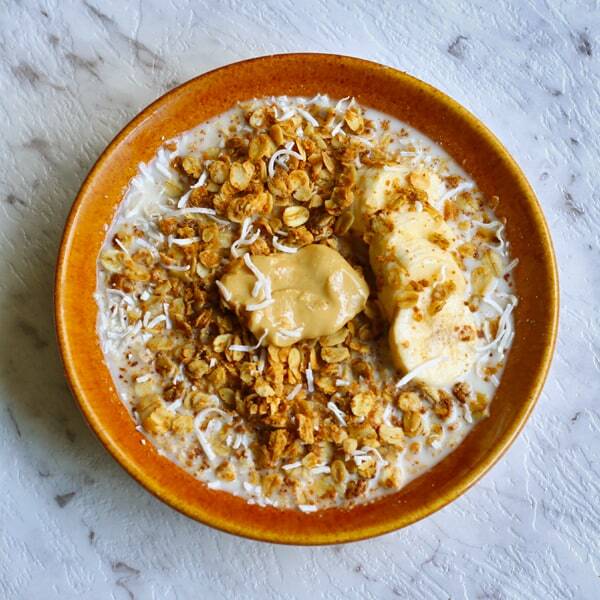 If you are adding the coconut flakes, I'd recommend adding them on top of the granola for the last 5 minutes of cooking. I use peanut butter that's already salted, but if yours isn't, sprinkle a little sea salt into the mixture. Nutrition information is based on one serve. Thanks for sharing this recipe. I’m curious as to what it looks like after coming out of the oven. I’m going to make this when my grandkids come over this weekend. This is so much healthier than the granola you buy at the store…and inexpensive. i’m excited to make this!! Thanks Jodie! I hope you enjoy!